Across the U.S., local governments are beginning to include goals and objectives that promote public health into their comprehensive plans. These long-term plans impact how people make choices of where to live and how to get around, their ability to access healthy foods and opportunities for physical activity, and affect broader issues of social equity, clean air and water, and more. Identify and determine to what extent municipalities and counties are addressing and integrating public health goals, objectives, and policies in their comprehensive planning efforts. Identify which elements of the plan include health policies, such as land use, open space, transportation, or urban design. Examine and evaluate the clarity, quality and comprehensiveness of public health goals and policies in a sample of the identified plans. Conduct case studies to analyze collaboration across the health and planning sectors, goal setting and policy development, and the implementation process. 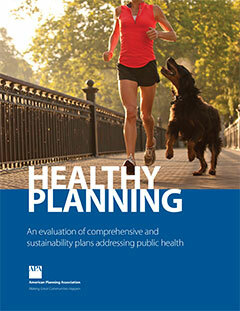 This study is the first to provide an in-depth, qualitative analysis of how public health became a part of the planning process. It provides context and background on collaboration between and public health departments, strong policy making, and successful implementation. Water is at the center of a healthy diet, and access to free, potable water plays a key role in addressing the obesity epidemic in the U.S. 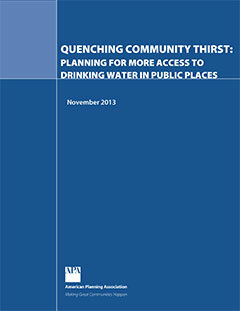 In this new report, Quenching Community Thirst, APA outlines strategies to promote access to drinking water as an essential step towards ensuring healthy, livable communities. The report shows which public health topics have been included the most and which topics receive the least attention. It also highlights plan strengths and weaknesses in addressing public health and identifies examples of robust policies from across the group of plans that promote health in their communities. 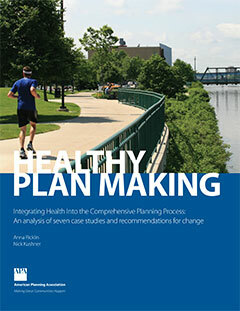 As part of the first phase of this project, APA developed a national, web-based survey to identify draft and adopted comprehensive and sustainability plans that explicitly include public health related goals, objectives, and policies, and inventory the public health topics included in the plans. It also identifies the opportunities and barriers that communities face in the development and adoption of such policies and assesses the current state of planning for public health nationally.